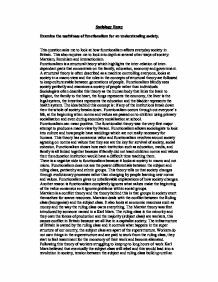 Sociology Essay Examine the usefulness of functionalism for an understanding society. This question asks me to look at how functionalism affects everyday society in Britain. This also requires me to look into depth at several other ways of society: Marxism, Feminism and interactionism. Functionalism is a structural theory which highlights the inter-relation of inter-dependant parts that concentrate on the family, education, economy and government. A structural theory is often described as a machine controlling everyone, looks at society in a macro view and the rules in the concepts of structural theory are followed to keep culture stable between generations of people. Functionalism blindly sees society perfectly and examines a society of people rather than individuals. Sociologists often describe this theory as the human body that links the brain to religion, the family to the heart, the lungs represents the economy, the liver is the legal system, the intestines represents the education and the bladder represents the health system. The idea behind this concept is: if any of the institutions break down then the whole of society breaks down. Functionalism occurs through out everyone's life, at the beginning when norms and values are passed on to children using primary socialisation and even during secondary socialisation at school. ...read more. Marxism believed that the solution for this sort of society is communism, where everyone shares everything and everything becomes communal. Marx believed that if a society was communist then the barriers between classes would fall and there would be no inequality, no relations of production and no ideology. The good side of Marxism is the fact that it is a structural theory and it links major institutions in the super structure. Marxism has a major influence on other theories in society such as feminism, but in feminism there is conflict between genders. Unlike functionalism, Marxism highlights the importance of economy in society and how society needs the economy to function. Marxism is sort of looking at the individual and their thoughts on society; an example of this is alienation. It shows how people think about how society is arranges and what part they play in society. Functionalists question the fact Marxism highlights the conflict between classes when there is clear evidence that there is harmony and shared values between them. If there was so much conflict then there wouldn't be social cohesion. It looks at the fact that economy and money runs society. Classic Marxism ignored the roles of women in society because men used to be much more powerful in society; women were not a part of the ruling class and did not own labourers. ...read more. of society an example of this is that not everyone relates the criminals to the justice system, people have their own individual system. Interactionism collects qualitative date of people and tells us that people change depending on how you feel and how you are treated in situations or institutions that affect your social life. Interactionists must gain the meanings and interpretations of individuals in society by putting themselves in those peoples shows and views, gaining empathetic understanding of them. This is called ethnography. A man called hobbs gave an example of Interactionism, he argued that people in the east coast of London have certain characteristics by entrepreneurship and scamming. It's within this context that needs for this behaviour must be understood. Symbolic Interactionism is the use of language and gestures in social action. Interactionism tells us that people can change themselves through common sense and past experience so they can modify their present action, so it is not the institutions that control our behaviour but individual perceptions of themselves. People who are labelled sometimes get more power through social obedience. An example of this is doctors, people obey doctors. Functionalism is a useful theory that explains modern society because it looks at how people work in everyday society with a range of different theories. ...read more. This candidate shows that they have a good all round knowledge of sociology, but I think in order to answer the specific question, Functionalism should be referred to in all paragraphs. This would improve the bad Ã¢â‚¬Å“listingÃ¢â‚¬Â fashion of structure that examiners hate, and in doing so would also gain the writer more evaluative points. For example, at the end of the Interactionism paragraph, I would write: Ã¢â‚¬Å“However Functionalists would give no credence to this micro approach, as they believe institutions influence the individual and not vice versaÃ¢â‚¬Â. In addition I feel that the conclusion could use another sentence or two, to further show what definitive answer the essay has naturally produced. Functionalist key terms are used Ã¢â‚¬Å“value consensusÃ¢â‚¬Â, Ã¢â‚¬Å“evolutionÃ¢â‚¬Â as well as more generic sociological terms, Ã¢â‚¬Å“micro and macro approachesÃ¢â‚¬Â showing the candidate has a good understanding of sociology in terms of specific theories and as a whole. I feel though that the essay needs to include more names of particular sociologists, especially within the many realms of feminism. For example I would include names such as Kate Millet (Ã¢â‚¬Å“Kate Millet would agree withÃ¢â‚¬Â¦Ã¢â‚¬Â), which would just add more weight to my points. Also, to improve the mark to a higher band, I would differentiate between the many strands of feminism, for example liberal and radical feminists would have very different views on Functionalist theory. Liberal feminism and Functionalist both believe that society is largely based on consensus, however radicals completely disagree. At GCSE one or two sentences to state this will go a long way in giving the right impression. The key Functionalist sociologistÃ¢â‚¬â„¢s name is Ã¢â‚¬Å“ParsonsÃ¢â‚¬Â not Ã¢â‚¬Å“ParsonÃ¢â‚¬Â. The use of casual spelling mistakes, Ã¢â‚¬Å“subordinated masculinities have les power and less statusÃ¢â‚¬Â shows the importance of proof reading, as these minor errors could be so easily corrected. Sociologists also need to be capitalised, Ã¢â‚¬Å“A man called hobbsÃ¢â‚¬Â, and normal words need to be made so as not to include unnecessary capital letters, Ã¢â‚¬Å“Ruling classÃ¢â‚¬Â to make the essay look more mature and less childish. Because her husband earns money, as they are married and ?share? things, she can live off her husbands money and he will pay for necesseties such as food and clothes and maybe even luxury items. Conjugal roles, might also be present, with men sometimes wanting to get married to have someone to rely on to do things like housework. on a hierarchy of social order whereas Marxists see it based on the two classes. The also both see society as telling us how to behave and we follow it not questioning. According to the organism analogy policy of functionalism society will evolve and change like a human body evolves to fit their surroundings. Feminist Criticism: Chinua Achebe's Things Fall Apart. Fine arts considered taboo to men indulging in any of its forms raised quite a stir within the community. Functionalism and The New Right. Engles: > Explains how the evolution of the family is closely linked to private property. Zaretsky: > The family offers consolation in a brutal society, but is also oppressive. Cooper: > The family is oppressive to our creativity. Therefore an exploitive family produces an exploitive society. Instead of saving money, I purchase useless items that are not necessary. Last March break, I went snowboarding with my friends in Banff with my brand new fast snowboard rather than paying off the debt I owed to my parents. Compare and contrast Karl Marx's and Michel Foucault's analysis of the concept power. It could be argued that it is in the interests of a captialist society to allow everyone to believe that they could succed if only they tried harder. This will ultimately result in more productivety. Marx believed Capitalism had actually made the class system simpler i.e. Besides, it can also develop from racial or religious differences, concern to language, behavior, customs, religion, and divisions amongst members of different ethnicities, races, and religious groups in society. Even it is often accompanied by feelings of dislike for other groups.